Achterberg, E.P., Moore, C.M., Henson, S.A., Steigenberger, S., Stohl, A., Eckhardt, S., Avendano, L.C., Cassidy, M., Hembury, D., Lucas M., Ryan-Keogh T J, Et al. Aerosol deposition from the 2010 eruption of the Icelandic volcano Eyjafjallajökull resulted in significant dissolved iron (DFe) inputs to the Iceland Basin of the North Atlantic. Unique ship-board measurements indicated strongly enhanced DFe concentrations (up to 10 nM) immediately under the ash plume. Bioassay experiments performed with ash collected at sea under the plume also demonstrated the potential for associated Fe release to stimulate phytoplankton growth and nutrient drawdown. Combining Fe dissolution measurements with modeled ash deposition suggested that the eruption had the potential to increase DFe by > 0.2 nM over an area of up to 570,000 km2 . Although satellite ocean color data only indicated minor increases in phytoplankton abundance over a relatively constrained area, comparison of in situ nitrate concentrations with historical records suggested that ash deposition may have resulted in enhanced major nutrient drawdown. Our observations thus suggest that the 2010 Eyjafjallajökull eruption resulted in a significant perturbation to the biogeochemistry of the Iceland Basin. (a) Modeled DFe enhancement (nM) as a result of ash deposition (15 April to 23 May) using midrange estimates of salt layer thickness (20 nm) of volcanic particles as obtained through leaching experiments. Contours mark 0.2nM DFe enhancement. The dashed line is the cruise track (May 2010). (b) The proportion of the Iceland Basin (assumed to be a region ~1 x 106 km2) receiving DFe inputs from ash (15 April to 23 May) using minimum (solubility 0.042%) and maximum (salt layer coating of 90nm thickness) estimates of Fe content of volcanic particles. Ryan-Keogh T J, Macey, A.I., Lucas M., Steigenberger, S.S., Stinchcombe, M.C., Achterberg, E.P., Bibby, T.S., Moore, C.M. The high-latitude North Atlantic (HLNA) is characterized by a marked seasonal phytoplankton bloom, which removes the majority of surface macronutrients. However, incomplete nitrate depletion is frequently observed during summer in the region, potentially reflecting the seasonal development of an iron (Fe) limited phytoplankton community. In order to investigate the seasonal development and spatial extent of iron stress in the HLNA, nutrient addition experiments were performed during the spring (May) and late summer (July and August) of 2010. Grow-out experiments (48–120 h) confirmed the potential for iron limitation in the region. Short-term (24 h) incubations further enabled high spatial coverage and mapping of phytoplankton physiological responses to iron addition. 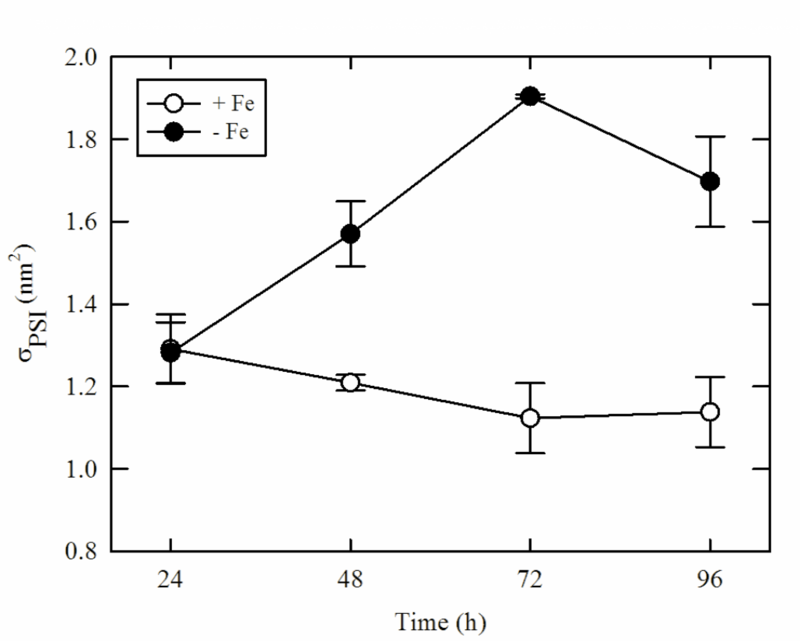 The difference in the apparent maximal photochemical yield of photosystem II (PSII) (Fv : Fm) between nutrient (iron) amended and control treatments (Δ(Fv : Fm)) was used as a measure of the relative degree of iron stress. The combined observations indicated variability in the seasonal cycle of iron stress between different regions of the Irminger and Iceland Basins of the HLNA, related to the timing of the annual bloom cycle in contrasting biogeochemical provinces. Phytoplankton iron stress developed during the transition from the prebloom to peak bloom conditions in the HLNA and was more severe for larger cells. Subsequently, iron stress was reduced in regions where macronutrients were depleted following the bloom. Iron availability plays a significant role in the biogeochemistry of the HLNA, potentially lowering the efficiency of one of the strongest biological carbon pumps in the ocean. (a) In situ chlorophyll data (μg L-1) and relative degree of Fe stress (Δ(Fv:Fm)+2.0 Fe), (b) in situ DIN (μmol L-1) data and Δ(Fv:Fm)+2.0 Fe and in situ DIN and different in net chlorophyll growth rate following Fe addition (ΔμChl (d-1)) relative to time of peak of bloom. Superimposed on panel (c) conceptualised model of bloom dynamics, demonstrating two different post-bloom scenarios (low DIN and high DIN) associated with different degrees of Fe stress and iron limited growth rates. Giddy, I., Swart S., Tagliabue, A. The canonical C/N/P ratio of 106/16/1 in phytoplankton has been instrumental in our understanding of ocean biogeochemical cycles and the development of numerical models as it couples the cycling of C to nutrients. However, this ratio can show marked variability and the processes driving these trends are still uncertain. There are, in particular, two main hypotheses to explain N/P ratios that deviate from 16/1. Firstly, it is postulated that species have specific, yet distinct, ratios that are averaged out over large spatial and temporal scales (Weber and Deutsch, 2010). Alternatively, varying optimal growth strategies resulting from physiological adaptation to environmental conditions could drive N/P variability, which simply averages out as 16/1 under current environmental conditions (Klausmeier et al., 2004). To address these hypotheses, we examine seasonal changes in the NO3- to PO43- ratio (via the geochemical tracer N*) on a section between Cape Town and Antarctica, where macronutrients are not fully depleted. Overall, we find roles for both species composition and physiology in driving the seasonal changes in N* depending on the location. Both mechanisms could act in concert and physiology was generally more important in regions undergoing large changes in phytoplankton biomass. Better understanding the driving mechanisms behind changes in the Southern Ocean N/P ratio is important as its signal is exported to low latitudes, having major impacts on global biogeochemical cycles. The concentration of Chl-a (mg.m) for the region of the GH line extracted from Globcolor data are provided for (a) early summer (December 2010) and (b) late summer (February 2011). Swart S., Thomalla S.J., Monteiro P.M.S., Ansorge I. J. Two sets of high-resolution subsurface hydrographic and underway surface chlorophyll a (Chl a) measurements are used, in conjunction with satellite remotely sensed data, to investigate the upper layer oceanography (mesoscale features and mixed layer depth variability) and phytoplankton biomass at the GoodHope line south of Africa, during the 2010–2011 austral summer. The link between physical parameters of the upper ocean, specifically frontal activity, to the spatially varying in situ and satellite measurements of Chl a concentrations is investigated. 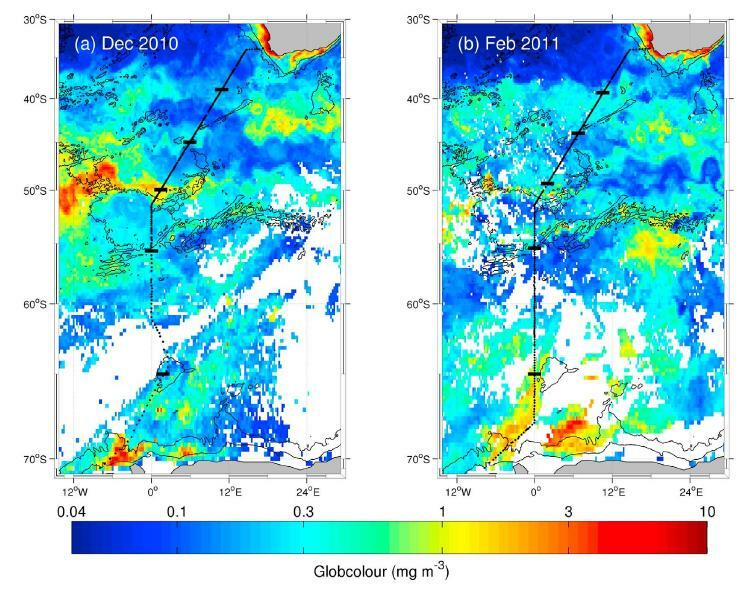 The observations provide evidence to show that the fronts act to both enhance phytoplankton biomass as well as to delimit regions of similar chlorophyll concentrations, although the front–chlorophyll relationships become obscure towards the end of the growing season due to bloom advection and ‘patchy’ Chl a behaviour. Satellite ocean colour measurements are compared to in situ chlorophyll measurements to assess the disparity between the two sampling techniques. The scientific value of the time-series of oceanographic observations collected at the GoodHope line between 2004 to present is being realised. Continued efforts in this programme are essential to better understand both the physical and biogeochemical dynamics of the upper ocean in the Atlantic sector of the Southern Ocean. slope is depicted by the grey line. Swart S., Chang N., Fauchereau, N., Joubert W., Lucas M., Mtshali T., Roychoudhury A. N., Tagliabue, A., Thomalla S.J.Alert: Add surname for Team member here, Monteiro P.M.S. Swart S., Chang N., Fauchereau, N., Joubert W., Lucas M., Mtshali T., Roychoudhury A. N., Tagliabue, A., Thomalla S.J., Monteiro P.M.S. One of the important gaps in the reliable prediction of the response of the Southern Ocean carbon cycle to climate change is its sensitivity to seasonal, subseasonal forcings (in time) and mesoscales (in space). The Southern Ocean Carbon and Climate Observatory (SOCCO), a CSIR-led consortium, is planning the Southern Ocean Seasonal Cycle Experiment (SOSCEx), which will be a new type of large-scale experiment. SOSCEx reflects a shift from the historical focus on ship-based descriptive Southern Ocean oceanography and living resource conservation, to system-scale dynamics studies spanning much greater time and space scales. The experiment provides a new and unprecedented opportunity to gain a better understanding of the links between climate drivers and ecosystem productivity and climate feedbacks in the Southern Ocean. This combined high-resolution approach to both observations and modelling experiments will permit us, for the first time, to address some key questions relating to the physical nature of the Southern Ocean and its carbon cycle. A space–time plot showing relative scale magnitudes of a number of platforms (ships, instrumented moorings and gliders), the seasonal cycle and climate projections. 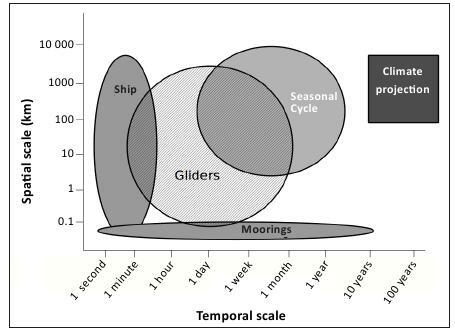 This graphical representation emphasises that, even with both ships and moorings observational platforms, it is not possible to address questions on the seasonal cycle sensitivity of climate projections without using autonomous platforms. Ocean gliders are uniquely poised to bridge the spatial and temporal gap between ships and moorings – a bridge which critically covers the seasonal ‘window’ in the Southern Ocean Seasonal Cycle Experiment. Loveday, B., Swart S., Storkey, D.
Ocean models require independent datasets to verify forecast accuracy. Glider data, within an appropriate reference frame, can satisfy this constraint. In the present paper, profiles from the northwest Mediterranean Sea are re-gridded to allow evaluation of modelled deepwater formation episodes. Time-series analysis of temperature, salinity, mixed-layer depth and ocean heat content show that the simulated response to surface flux is consistent with observations and the evolution of convective events is well represented. However, discrepancies in the distributions of the simulated Levantine Intermediate Water (LIW) and western Mediterranean deep water (WMDW) remain. A new ‘sweep’ methodology, developed in the present paper, indicates that the location and duration of the simulated convective events are consistent with that observed, but spatial variability is underrepresented. Variogram analysis ascribes integral scales similar to those observed for the mixed-layer depth, but suggests that simulated scalar fields are too diffuse. 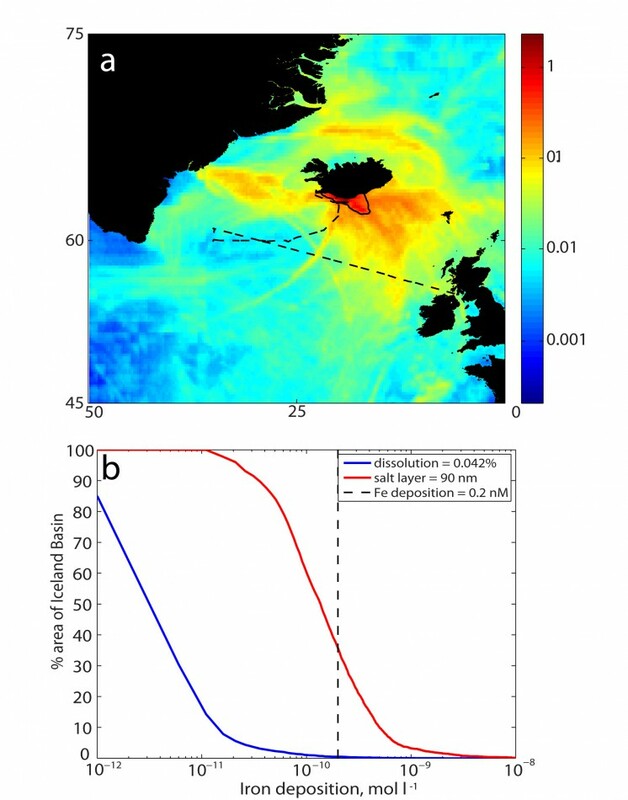 The ability to maximise the separation of temporal and spatial variability, inherent in this new methodology, confirms that glider data is suitable for validating high-resolution ocean models. Schematic overview of convection phases: (a) isopycnal doming and erosion of stratification during pre-conditioning; (b) wind-driven surface heat loss deepens the mixed layer via plumes during violent mixing; c) baroclinic instability breaks up the mixed patch, homogenous ater sinks and spreads, and surface destratification completes the event (adapted from Marshall and Schott, 1999). Tagliabue, A., Mtshali T., Aumont, O., Bowie, A., Klunder, M. B. , Roychoudhury A. N., Swart S.
Due to its importance as a limiting nutrient for phytoplankton growth in large regions of the world’s oceans, ocean water column observations of concentration of the trace-metal iron (Fe) have increased markedly over recent decades. Here we compile >13 000 global measurements of dissolved Fe (dFe) and make this available to the community. We then conduct a synthesis study focussed on the Southern Ocean, where dFe plays a fundamental role in governing the carbon cycle, using four regions, six basins and five depth intervals as a framework. Our analysis highlights depth-dependent trends in the properties of dFe between different regions and basins. In general, surface dFe is highest in the Atlantic basin and the Antarctic region. While attributing drivers to these patterns is uncertain, inter-basin patterns in surface dFe might be linked to differing degrees of dFe inputs, while variability in biological consumption between regions covaries with the associated surface dFe differences. Opposite to the surface, dFe concentrations at depth are typically higher in the Indian basin and the Subantarctic region. The inter-region trends can be reconciled with similar ligand variability (although only from one cruise), and the inter-basin difference might be explained by differences in hydrothermal inputs suggested by modelling studies (Tagliabue et al., 2010) that await observational confirmation. We find that even in regions where many dFe measurements exist, the processes governing the seasonal evolution of dFe remain enigmatic, suggesting that, aside from broad Subantarctic – Antarctic trends, biological consumption might not be the major driver of dFe variability. This highlights the apparent importance of other processes such as exogenous inputs, physical transport/mixing or dFe recycling processes. 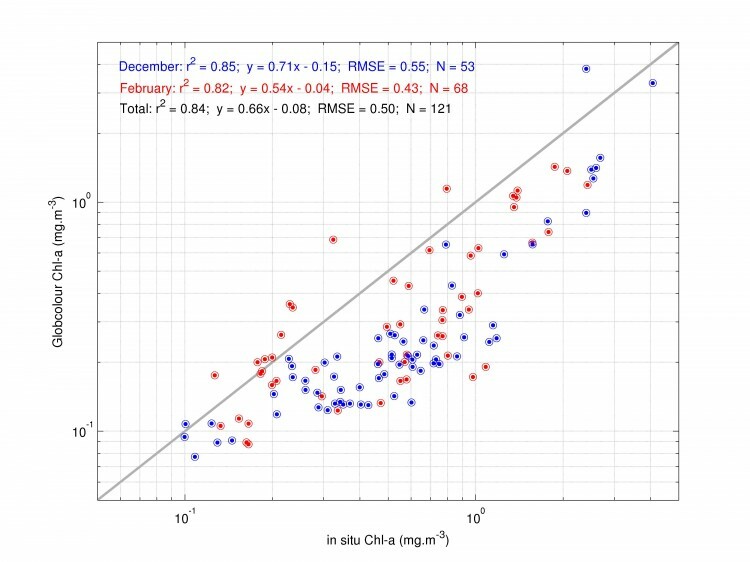 Nevertheless, missing measurements during key seasonal transitions make it difficult to better quantify and understand surface water replenishment processes and the seasonal Fe cycle. Finally, we detail the degree of seasonal coverage by region, basin and depth. By synthesising prior measurements, we suggest a role for different processes and highlight key gaps in understanding, which we hope can help structure future research efforts in the Southern Ocean. Distribution of iron data in the Southern Ocean with regional breakdown for different ocean regimes and basins. Ryan-Keogh T J, Macey, A.I., Cockshutt, A.M., Moore, C.M., Bibby, T.S. Iron availability limits primary production in >30% of the world’s oceans; hence phytoplankton have developed acclimation strategies. In particular, cyanobacteria express IsiA (iron-stress-induced) under iron stress, which can become the most abundant chl-binding protein in the cell. Within iron-limited oceanic regions with significant cyanobacterial biomass, IsiA may represent a significant fraction of the total chl. We spectroscopically measured the effective cross-section of the photosynthetic reaction center PSI (σPSI ) in vivo and biochemically quantified the absolute abundance of PSI, PSII, and IsiA in the model cyanobacterium Synechocystis sp. PCC 6803. We demonstrate that accumulation of IsiA results in a 60% increase in σPSI , in agreement with the theoretical increase in cross-section based on the structure of the biochemically isolated IsiA-PSI supercomplex from cyanobacteria. Deriving a chl budget, we suggest that IsiA plays a primary role as a light-harvesting antenna for PSI. On progressive iron-stress in culture, IsiA continues to accumulate without a concomitant increase in σPSI , suggesting that there may be a secondary role for IsiA. In natural populations, the potential physiological significance of the uncoupled pool of IsiA remains to be established. However, the functional role as a PSI antenna suggests that a large fraction of IsiA-bound chl is directly involved in photosynthetic electron transport. The in vivo effective absorption cross-section of PSI (σPSI) measured on Synechocystis PCC 6803 under iron-replete (+Fe) and iron-deplete (-Fe) conditions. Displayed are results averaged from triplicates from three independent experiments with ±standard errors. Goni, G., Roemmich, D. , Swart S., et al. The Ship Of Opportunity Program (SOOP) is an international World Meteorological Organization (WMO)-Intergovernmental Oceanographic Commission (IOC) program that addresses both scientific and operational goals to contribute to building a sustained ocean observing system. The SOOP main mission is the collection of upper ocean temperature profiles using eXpendable BathyThermographs (XBTs), mostly from volunteer vessels. 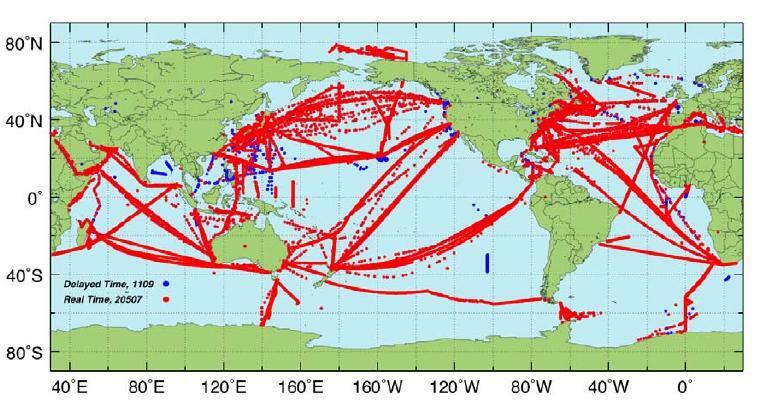 The XBT deployments are designated by their spatial and temporal sampling goals or modes of deployment (Low Density, Frequently Repeated, and High Density) and sample along well-observed transects, on either large or small spatial scales, or at special locations such as boundary currents and chokepoints, all of which are complementary to the Argo global broad scale array. Billany, W., Swart S., Hermes, J., Reason, C.
Maps of Absolute Dynamic Topography (MADT) at the Greenwich Meridian are used to identify the locations and gradients of the various fronts in the Southern Ocean (Subtropical Front, Sub-Antarctic Front, Antarctic Polar Front, Southern ACC Front, and Southern Boundary of the ACC). It is found that the frontal gradients in Sea Surface Height (SSH) used to determine these fronts are consistent with those determined from hydrographic data. A strong relationship was found to exist between the position of all the fronts and the gradients of SSH except for the Southern Boundary (SBdy) front. 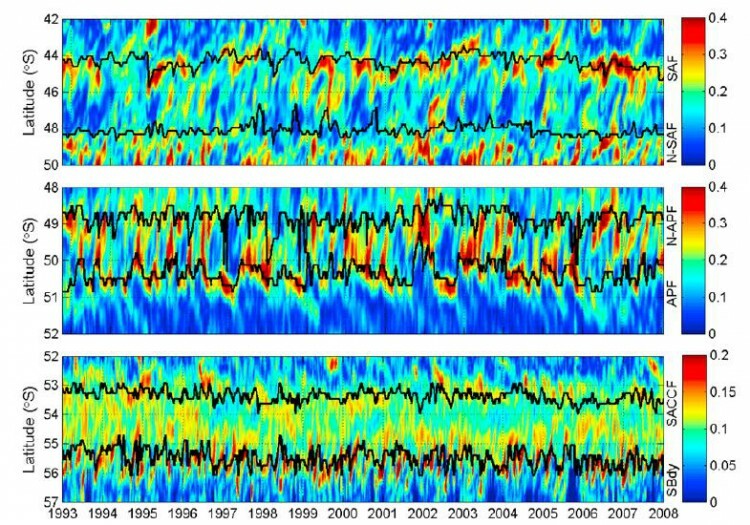 Substantial seasonality and interannual variability in the frontal positions is found. All the fronts except the Antarctic Polar Front (APF) show a poleward tendency in position over the last 15-years. Using the MADT-derived frontal positions, the meridional zones between the fronts are examined and the mean zonal sea surface temperature (SST) is used to consider the surface variability in these frontal zones. In addition to the strong seasonality and interannual variability in the SST of these frontal zones, there is also a tendency towards warming (cooling) of the Sub-Antarctic and Antarctic Polar Zones (Southern Boundary Zone). The tendencies in the frontal positions are consistent with a warming in the Southern Ocean except near the APF and the Southern ACC Front (SACCF). Collection of Hovmöller plots of the surface geostrophic velocity magnitudes (colour surface plot; in ms− 1) and latitudinal frontal positions of the ACC (black lines) at the Greenwich Meridian from January 1993 to December 2007. (a) STF, (b) SAF, (c) APF, (d) SACCF, (e) SBdy. Swart et al. 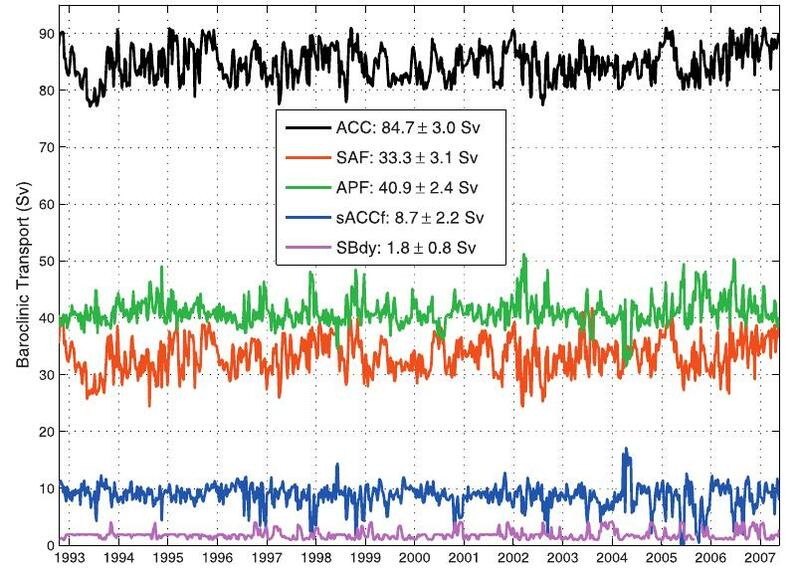 (2010) applied altimetry data to the gravest empirical mode south of Africa to yield a 16 year time series of temperature and salinity sections. In this study we use these thermohaline sections to derive weekly estimates of heat content (HC) and salt content (SC) at the GoodHope meridional transect of the Antarctic Circumpolar Current (ACC). These estimates compare favorably to observed data. The resulting 16 year time series of HC and SC estimates are used to explain the subsurface thermohaline variability at each ACC front and frontal zone. The variability at the Subantarctic Zone (SAZ) is principally driven by the presence of Agulhas Rings, which occur in this region approximately 2.7 times per annum and are responsible for the longest and highest scales of observed variability. The variability of the SAZ is responsible for over 50% and 60% of the total ACC HC and SC variability, respectively. Poleward of the SAZ, the variability is largely determined by the influence of the local topography on the fronts of the region and can be explained by the conservation of potential vorticity. Wavelet analysis is conducted on the time series of meridionally integrated HC and SC in each ACC front and frontal zone, revealing a consistent seasonal mode that becomes more dominant toward the southern limit of the ACC. The lower-frequency signals are compared with two dominant modes of variability in the Southern Ocean. 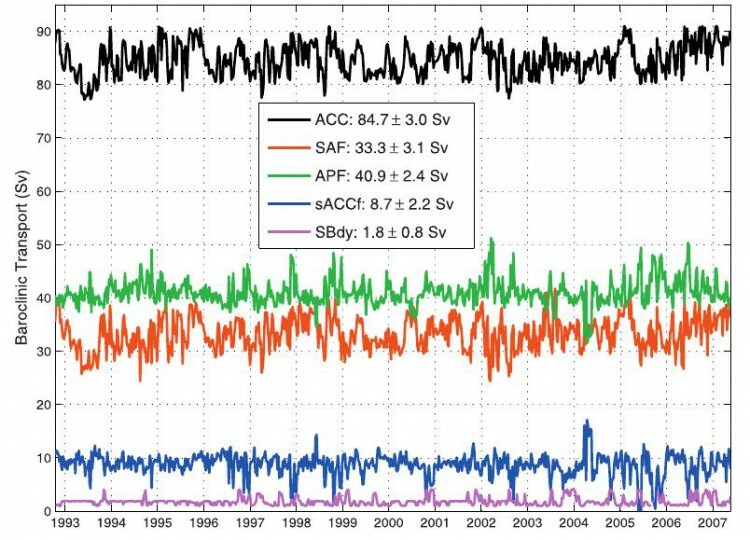 The Southern Annular Mode correlates well with the HC and SC anomaly estimates at the Antarctic Polar Front, while the Southern Oscillation Index appears to have connections to the variability found in the very southern domains of the ACC. The propagation of an Agulhas Ring into the SAZ is identified using satellite altimetry data. These northerly originating features cause sharp changes in climate and biogeochemical variables in the SAZ. Swart S., Speich, S., Ansorge I. J., Lutjeharms, J. R. E.
Hydrographic transects of the Antarctic Circumpolar Current (ACC) south of Africa are projected into baroclinic stream function space parameterized by pressure and dynamic height. This produces a two-dimensional gravest empirical mode (GEM) that captures more than 97% of the total density and temperature variance in the ACC domain. Weekly maps of absolute dynamic topography data, derived from satellite altimetry, are combined with the GEM to obtain a 16 year time series of temperature and salinity fields. 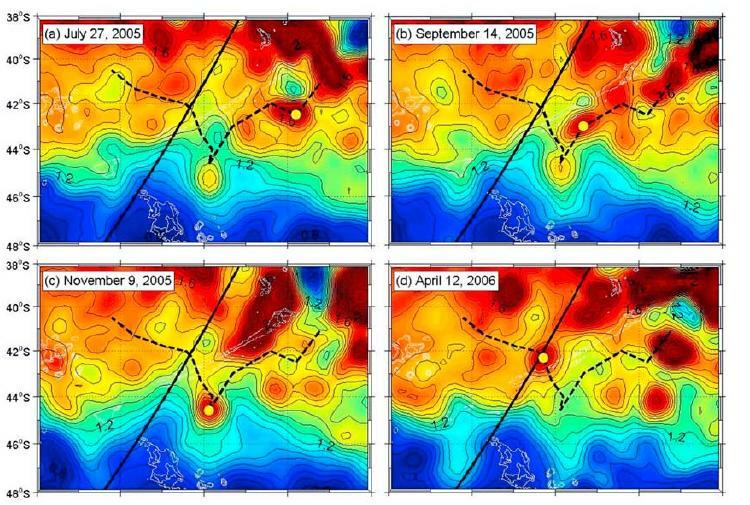 The time series of thermohaline fields are compared with independent in situ observations. The residuals decrease sharply below the thermocline and through the entire water column the mean root-mean-square (RMS) error is 0.15°C, 0.02, and 0.02 kg m−3 for temperature, salinity, and density, respectively. The positions of ACC fronts are followed in time using satellite altimetry data. These locations correspond to both the observed and GEM-based positions. The available temperature and salinity information allow one to calculate the baroclinic zonal velocity field between the surface and 2500 dbar. This is compared with velocity measurements from repeat hydrographic transects at the GoodHope line. The net accumulated transports of the ACC, derived from these different methods are within 1–3 Sv of each other. Similarly, GEM-produced cross-sectional velocities at 300 dbar compare closely to the observed data, with the RMS difference not exceeding 0.03 m s−1. 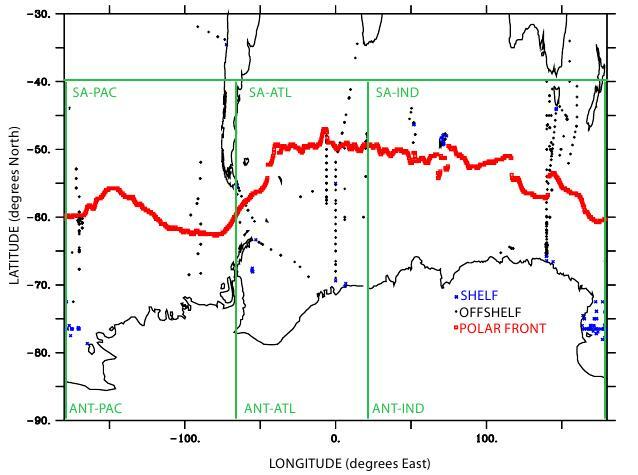 The continuous time series of thermohaline fields, described here, are further exploited to understand the dynamic nature of the ACC fronts in the region, and which is given by Swart and Speich (2010). Location of the altimetry-determined ACC fronts (black lines) overlaid onto the surface geostrophic velocities (in colour). Swart S., Speich, S., Ansorge I. J., Goni, G., Lutjeharms, J. R. E.
Data from five CTD and 18 XBT sections are used to estimate the baroclinic transport (referenced to 2500 dbar) of the ACC south of Africa. Surface dynamic height is derived from XBT data by establishing an empirical relationship between vertically integrated temperature and surface dynamic height calculated from CTD data. This temperature-derived dynamic height data compare closely with dynamic heights calculated from CTD data (average RMS difference = 0.05 dyn m). A second empirical relationship between surface dynamic height and cumulative baroclinic transport is defined, allowing us to study a more extensive time series of baroclinic transport derived from upper ocean temperature sections. From 18 XBT transects of the ACC, the average baroclinic transport, relative to 2500 dbar, is estimated at 90 ± 2.4 Sv. This estimate is comparable to baroclinic transport values calculated from CTD data. We then extend the baroclinic transport time-series by applying an empirical relationship between dynamic height and cumulative baroclinic transport to weekly maps of absolute dynamic topography derived from satellite altimetry, between 14 October 1992 and 23 May 2007. The estimated mean baroclinic transport of the ACC, obtained this way, is 84.7 ± 3.0 Sv. These transports agree well with simultaneous in-situ estimates (RMS difference in net transport = 5.2 Sv). This suggests that sea level anomalies largely reflect baroclinic transport changes above 2500 dbar. 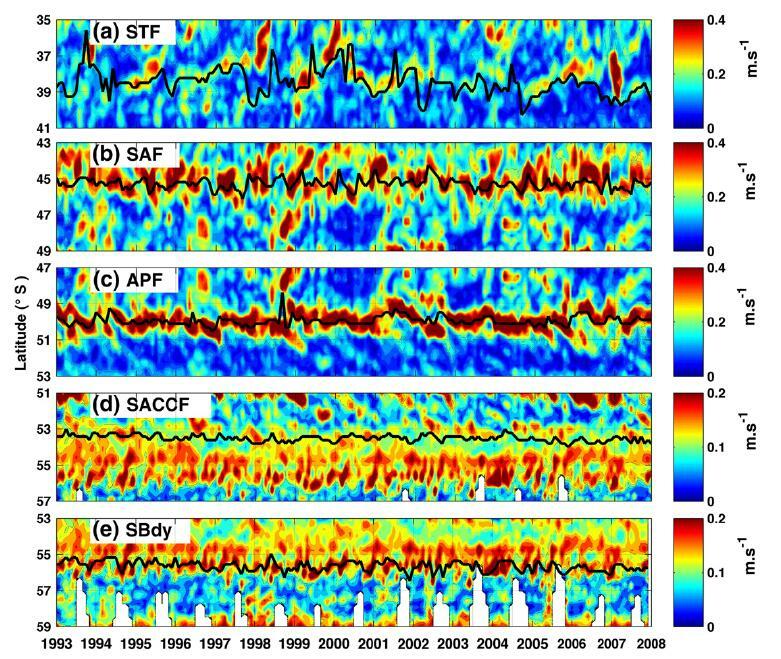 A 15 year time series of transports (in Sverdrups) of the ACC and associated fronts as derived from satellite altimetry using proxy techniques.